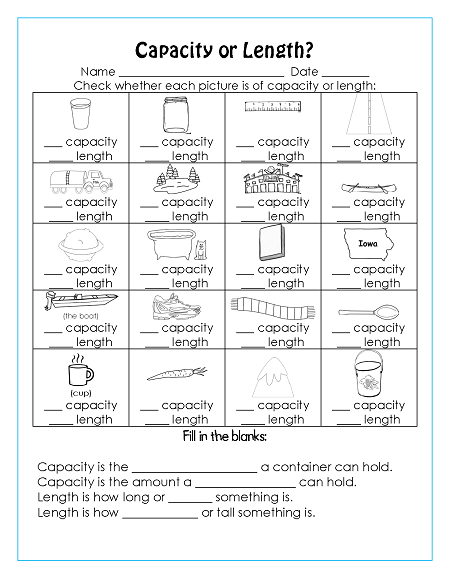 This post is about a capacity or length free printable. 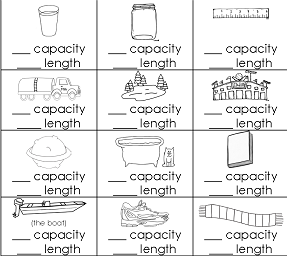 The book to read is Capacity! Yes, this book should be read aloud to children. Students may not want to select it at the library, but the books in the Math Counts series are important in helping to develop math concepts. This book could be read at home or at school. Some other books in the the series include Length, Weight, Shape, Numbers, Patterns, Sorting, Counting, Time, and Size. These books are all excellent for helping children to understand different math areas. The photos are of real life applications of the titles. Real trucks, real cars, real homes and more are included in the photos. These books are short but the ideas are huge. Children can learn to communicate and reason mathematically with these books. The text is short and simple to make opportunities for math discussion. After reading the books, children will notice similar situations when riding in the car or being outside and walking. Really, it helps children in math if parents and teachers read books like the ones in this series. I hope you read these books aloud and find time for discussion. Math opens doors to a child’s future. 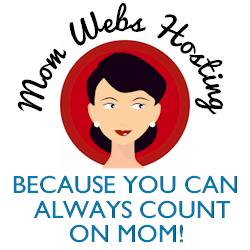 Here is a link to the Cool Math site with online activities for children, with activities for different ages.